Sponsorship for the 25-year-old’s trip was provided by Victoria-based Videa International Youth Internship Program, the International Aboriginal Internship Program and Global Affairs Canada. The programs covered Simon's travel, accommodation and food while in Africa. In preparation for the four-month job in Africa, Simon took a two-week training course in Sooke and two weeks in Uganda, which included an education in gender equality, governance and sustainable environment. In total there were 10 youth interns and two team leaders who traveled to Africa as part of the program. The flight took 42 hours from Vancouver to Uganda, and on route they missed a flight and stayed the weekend in Kenya. While in Kenya Simon went to the museum and was intrigued by African history and learned about the eastern slave route. Simon stayed in Zambia for two weeks and three months in Uganda. Once Simon arrived in Uganda he was placed in a school compound. He set up his living quarters in a hut that was built out of brick and a grass roof thatch. He said there are a lot of crickets in the hut, and they were very noisy. Simon was stationed at the Rise and Shine primary school and taught English to Grade 1 and 2 students. There are 450 students at the school, with 56 per class. All the students and adults speak Lusoga, which is a Bantu language of Uganda. Simon was struck by the fact there is no technology at the compound. Also, they use solar panels for electricity, which is mainly turned on at night time. Simon learned about the local economy and the difficulty of growing corn, mango and peanuts due to a drought. He shared about the moose hide campaign and about his culture while in Africa. He also said it was hard to talk about spirituality and culture due to colonization. 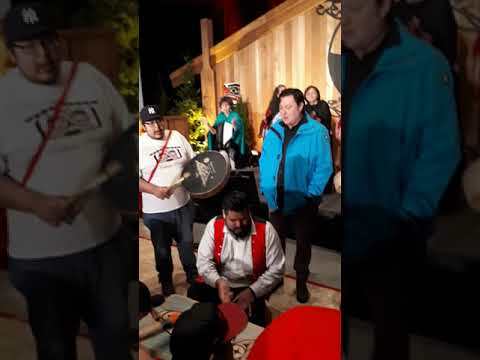 Simon attended a wedding and witnessed two traditional dancers perform. Simon found the people of Africa very hospitable and friendly. The youn man found the food to be very different in Africa. Their diet consists of mostly proteins, with rice, beans, corn, cabbage, bosho, banana and shema, which is a cornmeal. They rarely eat meat. Meat is a luxury in Africa. Simon said they got the same food every day, and was not accustomed to using his hands to eat. Simon and the other youth bought two goats for the Independence Day football (soccer) game. There were eight men's teams and five women's teams. The goats were given as prizes to the winner of the soccer games; one for the men and one for the women. They were very happy and excited to get the goats, which were later slaughtered for food. Simon said he tried eating goat and found it very tough but liked the taste. The temperature in Uganda was 39 degrees and was a dry heat. At the compound where Simon stayed they had to pack water every day for showering and washing clothes. Some of the people walk 25 minutes to get water, which has to be boiled for cooking and drinking. The students had to buy bottled water to brush their teeth. Simon realized how much he took things for granted and looks at things differently now that he’s back home. The compound he stayed at is right next to the Nile River. The Nile River is the longest in the world at 4,160 miles in length and flows into the Mediterranean Sea. Simon and the other youth members could not swim in the Nile River because it is infested with parasites. While there Simon contracted malaria and said it's 10 times worse than the flu. He was admitted into the hospital for a couple days, recovering from the virus. Malaria is transmitted through mosquito bites. Simon and the youth visited Victoria Falls, a waterfall in southern Africa. Listed as one of the Seven Wonders of the World, he said the falls were beautiful and breathtaking. Upon his return home Simon stayed in Sooke to reintegrate back into Canadian society. Simon has traveled to other places beyond Canada, and is interested in going to Asia to do the same work he did in Africa. He plans on working here to save money, or to seek sponsorship. Simon would like to return to Africa one day to further his education and to reconnect with people he met.